Great for the classroom or for the play room, Don't Take My Word is a fast paced card game where in an attempt to make your word, you'll mess up the word form someone else. Eighty letters come in the small tuck box along with the game rules to help you get started playing. 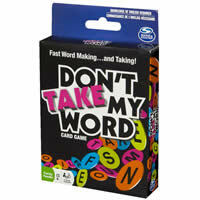 Don't Take My Word is fun and educational if you want to use it as a spelling tool. Small and simple makes a great card game and this one fits the bill. Take it with you on vacations or keep it in the car so you'll have it where ever you go. Be sure to check the game rules so you know how the scoring works (more points the longer the word). Give Don't Take My Word a try today. To become with winner you are trying to gain the highest score. This simple card game will come with 80 letter cards and the official Don't Take My Word game rules and instructions. Please keep in mind that the official Don't Take My Word dice-card rules and instructions could be different depending on the game version you have. The rules below are some of the exact directions on how to play Don't Take My Word. Share with us your comments, funny stories, tips, advice, strategies, creative ways to play, questions about how to play, problems with the rules or anything you want about Don't Take My Word. All submissions will be reviewed within 24 hours. Click here to add your Don't Take My Word comments.